Jaipur, 16 December: As a part of the weekend theatre and cultural activities at Jawahar Kala Kendra (JKK), a play ‘Mukkam Dehru, Jila Nagaur’, presented by the Jaipur based Ujaagar Dramatic Association was staged today. Set in 1942, the play depicted, on one side, revolution in a pre-independent India with Gandhi announcing the Quit India movement. On the other hand the rest of the world was burning in the flames of World War 2, spear-headed by one of the greatest dictators of all times – Adolf Hitler. In a wholly unique, hilarious tale Jaipurites witnessed a chance meeting of an uninvited guest, Adolf Hitler, and a bewildering array of characters trying to put up a ridiculous play in a remote village of Dehru forgotten in one dusty corner of Rajasthan. In a cauldron were placed Hitler and his loyal secretary Goebbels, two British spies, an over enthusiastic young revolutionary fighting for independent India, a quack who invents medicines at the snap of his fingers, a Shakespeare loving British police officer, a ghost fearing local constable, a film struck director directing a play in Marwadi, a starry eyed young girl waiting to be a heroine, a barber trying hard to mug his lines and a house wife aspiring to be a political leader. The 95 minute play was a deliciously funny exploration of mistaken identities and a disastrous rehearsal of an equally disastrous play, all woven together in one crazy blend of history and fiction. The play was directed by Mohit Takalkar and written by Paresh Mokashi. 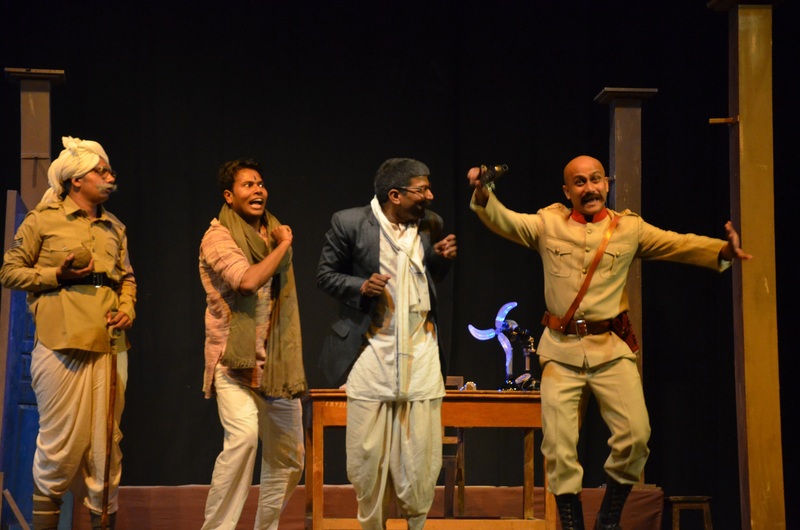 In the play Hitler was played by Sahi Abuja, Gobbles by Abhishek Mudgal, Agent Y by Anuranjan Sharma, Agent X by Shubham Bagri, Bhairon Singh by Arvind Singh Charan/Chandrabhan, Inspector Cook by Shahjahan Hussain, Vaidji by Deepak Gurjar/Aasif Khan, Bhaskarmal by Mahadev Singh Lakahwat/Yogesh Parihar, V. Sitaram by Rajveer Singh Palawat, Kalli Kaaki by Ipshita Singh Palawat, Mangilaal by Ajeet Singh Palawat/ Shubham Pareekh, Kundalini by Poornima Verma.